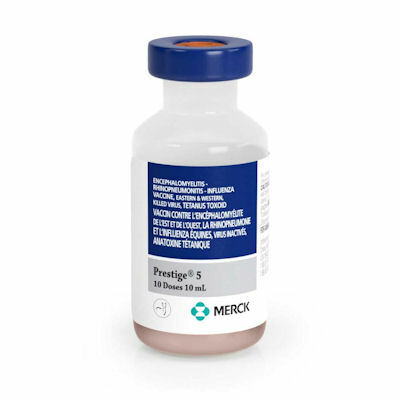 Prestige 5 with Havlogen (Merck) (10 Dose vial) is a 7-Way Vaccine that protects against Eastern And Western Encephalomyelitis, Flu(A1, A2 And KY '93), Tetanus and Rhinopneumonitis (EHV-1 And EHV-4). Havlogen adjuvant gives rapid immunity and disease protection. Administer 1ml dose IM, repeat in 3 to 4 weeks and annually thereafter. This vaccine is safe for pregnant mares. Prestige V single dose is also available on this site. Vaccine shipments are only shipped on Monday, Tuesday and Wednesday of each week in a styrofoam container with ice packs.